Trade shows are what you make of them, and at an event on the scale of Dreamforce, there's a whole universe of potential waiting there for you to leverage. But you need the right tools to do it. Packing the right supplies beforehand can mean the difference between a show where you're owning the experience at every handshake, and a show where you're constantly patting your pockets trying to figure out where you left something important. 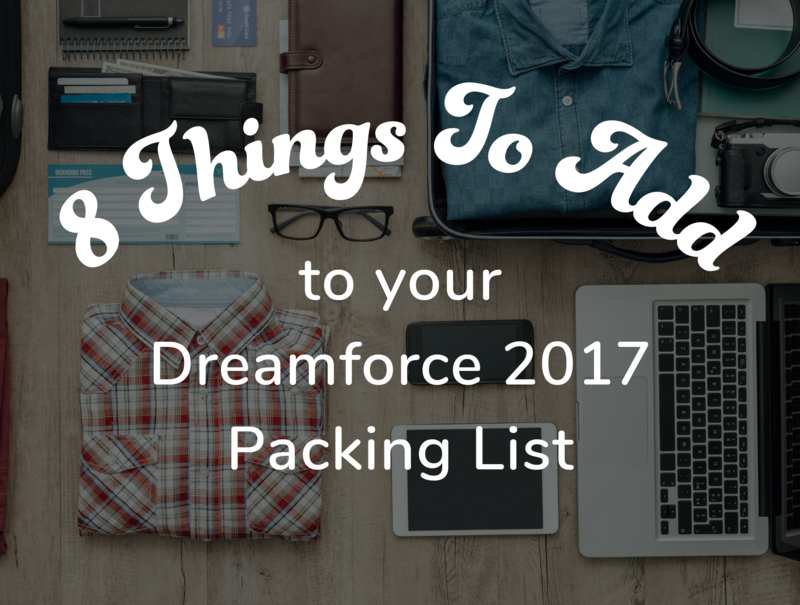 So before you head out to Dreamforce 2017, double – or triple – check that you have the following things packed. Less time spent worrying about what you might be missing means more time spent learning, networking and living it up! When you're at Dreamforce 2017, it probably goes without saying that on top of all the learning you plan to do, you want to put your best foot forward, get your or your company's name out there and make sure you make an impression. Part of that is making sure that the people you talk to can get ahold of you after the show. Whatever your role, and whatever your goal, you don't want to be caught without a business card when you finally get 45 seconds with a person you're dying to connect with. Don't bring just a few — bring hundreds of them with you – and don't forget them in your hotel room! Sure, trade shows are generally a veritable sea of free pens and notepads. But if you're sitting in a session and hear a good data point, it's much easier to type it out and save it for later than to scrawl it on a promotional pad that you might lose before the end of the show. Plus, a truly dynamic Dreamforce experience may require you to touch base with your boss or home office. You might also want to live-tweet or otherwise blog about the experience as it's happening. Yes, we have smartphones that can do these things – but for communicating more thoroughly, you'll want to have a full keyboard available. 3. Hard Copy Schedules, Phone Numbers, etc. One of Murphy's Trade Show Laws (as we've just now coined them) is that if you're planning on relying on Google Maps to find your way around, checking your email to get the number of someone you need to meet up with etc., you will invariably find that it's the one time when your internet connection fails. Maybe your mobile network is suddenly down. Maybe you find yourself in a Faraday cage of a conference room. Maybe you accidentally deleted an email that you were planning to pull information from. The point is, technology can fail you sometimes. It never hurts to keep any information you can't live without in a hard copy format, just in case there's a tech hiccup at the most inopportune moment. That said, Dreamforce 2017 has an app available to guide your experience that will be just as critical as any map of San Francisco – make sure to install it! These days, our entire world centers around our device being charged, yet we'll still invariably sometimes forget our chargers. Don't let Dreamforce 2017 be one of those times. You may be able to find a charging station somewhere at the event, or happen to run into someone who has a charger that matches your device, but why chance it? When you're trying to make the most out of Dreamforce 2017, you're not going to want to be nervously glancing at your phone or computer every ten minutes, hoping your battery doesn't drop to zero percent before you can get back to the hotel. Want to review a recording you made, watch a piece of video content someone just directed you to, or make a quick call to fill someone in on what you've gotten out of Dreamforce, thus far? It's a lot easier to do that with your headphones plugged into your laptop or smartphone than it is to listen on computer speakers over the ambient noise of a busy conference. At an event like Dreamforce, you never know where the day, or night, could take you. So come prepared to dress to impress for every occasion. Even if it feels like you're packing extra, those extra casual slacks may come in handy. Swag abounds at shows like Dreamforce, and if you're looking to promote your services or your company, it's worth your while to show up with something someone will remember you by. An inventive or fashionable tchotchke, a brochure with a unique promotion and the like can go a long way in promoting brand awareness. Plan this out with your company beforehand and determine just what kind of giveaway will best represent you – and make you stick out – to the massive audience at Dreamforce. This is one of the most important things not to forget – and you won't be packing this one in your suitcase, but in your head. You'll be engaging in countless conversations throughout Dreamforce, and as you're navigating potential business relationships, you have to remember why you are important. What is your business there for? What value do you provide? What can you do for the person you are speaking with? And what's a strong finisher that doesn't let the conversation hang awkwardly at the end? Keep these thoughts in your back pocket, and let them be the driving force behind sincere conversations. Finding the sweet spot between having fun and displaying your value is as key as anything in your luggage to making the most out of the exciting event that is Dreamforce 2017.